IRELAND’s NICOLAS ROCHE has been unveiled at Team Sky along with four other new names for 2015. The 30-year-old, who has a wealth of Grand Tour experience, is joined at the British squad by Scot Andrew Fenn, Czech rider Leopold Konig, Dutchman Wout Poels and Lars Petter Nordhaug, who has re-signed for Team Sky after two years away. Roche’s signing is significant as it strengthens Chris Froome’s support for the 2015 Tour de France, while simultaneously weakening Alberto Contador’s squad as the Irishman was previously at Tinkoff-Saxo. Roche, who had been in talks with a number of teams, now joins Letterkenny man Philip Deignan at SKY. He enjoyed an impressive season and claimed victory in the Route du Sud while finishing fifth in the Tour of Britain. In 2013, he finished fifth at the Vuelta a Espana. Team Sky principal Dave Brailsford said: “He brings a wealth of experience, having ridden 13 Grand Tours in his career, and that will be invaluable to the team. super happy to be part of @TeamSky next year, thank you @tinkoff_saxo for those great 2 years. Konig is also likely to play a strong support role for Froome, while also riding Grand Tours for a high placing himself. While with Team Net-App-Endura, Konig placed seventh in the 2014 Tour de France and he has claimed stage wins at the Vuelta a Espana, Tour of California and Tour of Britain. The 24-year-old Fenn becomes Team Sky’s first Scottish rider, after moving from Mark Cavendish’s Omega Pharma-QuickStep squad. Email “Ireland's Nicolas Roche joins Team SKY for 2015 season”. 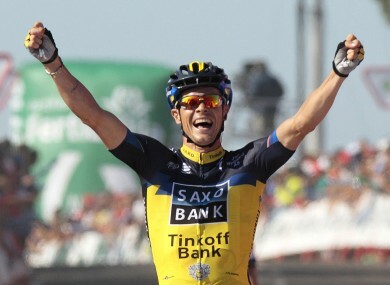 Feedback on “Ireland's Nicolas Roche joins Team SKY for 2015 season”.